HomeConcern as Ireland is predicted to fail to meet its GHG target by wide margins! The predicted reduction by 2020 for the non-traded sector (including agriculture, transport, non-energy intensive industry and waste) is 4-6% below 2005 levels, with 74% of this being attributed to Agriculture and transport. Laura Burke, EPA’s director general commented that; “…they are a disappointing indicator that current policy measures are failing in an improving economy.” She pointed out that Ireland is committed to reducing carbon emissions by 80% by 2050 compared to 1990 levels. She said that if we are to achieve a low-carbon economy, new measures are needed. An overall emission increase of 5.4% was noted by the (EPA). Below are some of the increasing areas. •	Power generation by 6.6%. When asked about the increase in these figures, EPA programme manager, Dr Tom Ryan described them as disappointing and noted that we need to break our dependence on fossil energy to allow us deliver on national policy targets. If you have any questions regarding greenhouse gas emissions or targets please do not hesitate to contact one of our experienced Consultants by filling in the form below. 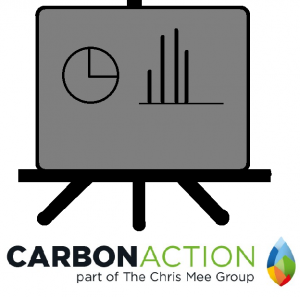 Carbon Action – Part of Chris Mee Group are a leading provider of environmental related consultancy services in Ireland & abroad. Our clients range from large multinationals to SMEs.